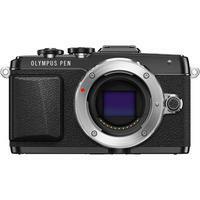 The Olympus PEN E-PL7 is an exquisitely designed, compact, lightweight and retro-styled camera with an all-metal finish. Created specifically to capture 'superior selfies', the E-PL7 features a large, flip-down and tiltable high-res LCD touchscreen, built-in WiFi via a compatible smartphone, fast AF and start-up and great image quality thanks to the 16.1 megapixel Live MOS sensor and TruePic VII image processor. The built-in WiFi function allows for enhanced remote control of the camera, including zooming in and out, adjusting aperture and shutter speed and setting the self-timer. Also featured are an array of automatic selfie mode' settings, including wide-angle lens position and portrait mode, 14 art filters for a wide range of creative effects and Live Guide for real-time adjustment of manual settings.